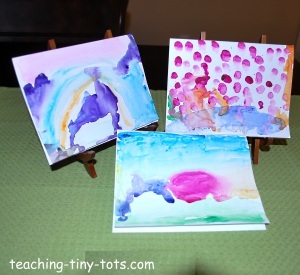 Toddler Activities: Use watercolors to make a card or a picture. 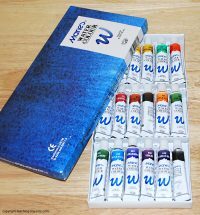 Here is an easy way to introduce water colors by using water colors that come in a tube. It's very easy for children using watercolor sets for the first time to end up getting colors all mixed together making a pool of brownish black. Learning how to rinse a brush after each color is the key to painting with the Crayola and Rose Art sets used for school. Cut to size desired. 5 x 7 inches is a good size for a card. Choose a few colors and squeeze a pea sized drop in one of the sections on the palette. Fill bowl with water. 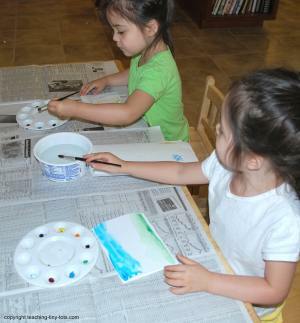 Show your child how to wet brush, select a color and rinse before using another color. Dry flat to avoid drips. Use as a card, frame or mount on a construction paper to display. For a beginner use two or three colors first. Use two primary colors and let your child experiment with what happens when the two colors blend together.